At one point, Black men were content to hold up the corner. Seated on crates, older men would reflect as they watched the youngsters playing ball, youth strutting with newly discovered charisma and power, and parents holding onto their babies’ hands as they acknowledged the men with either a smile or greeting. Their wives sat on porches drinking tea, chewing snuff, watching the little ones or perhaps gardening or pulling weeds. Laughter illuminated these sacred spaces filled with love, the balm a protective covering for all in its embrace. Such was the Ferguson Mike Brown grew up in. Just finished with high school, he was thinking about his future when his life was taken randomly as if Black lives are temporary without a future tense. “Whose Streets?” (2017) by writer-director-producer Sabaah Folayan and director-producer Damon Davis is a question Ferguson asks the world. 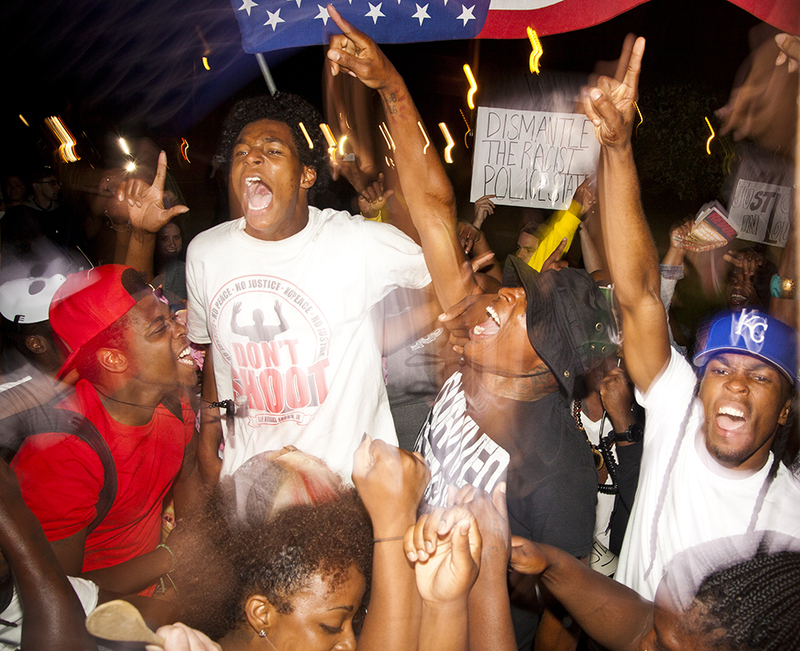 Michael Brown, 18, multiplied by so many others, too many in a town where Black and white walk along a delineated line – “unequal” about the only aspect of the Dred Scott decision that remains: “The court found that no Black, free or slave, could claim U.S. citizenship, and therefore Blacks were unable to petition the court for their freedom.” They had “no rights which the white man was bound to respect,” wrote Chief Justice Taney. We see Dred Scott on one of the street signs in the film, “Whose Streets?” a document that shows why it was important to highlight for the world the other Ferguson towns throughout America and abroad, places where capitalism has erased human value, the strategies and spirit of a people who, fed up and ready to move on the police, galvanized everyone eager not to let Mike Brown’s death be in vain. It became a family affair for Brittany Ferrell, 25, a college student and single mother. She models for her daughter Kenna over the three or four years leading up to the acquittal of killer cop Darren Wilson in the Brown case what resistance looks like and her daughter gets it. Ferrell and other queer friends found Millennial Activists United (MAU). David Whitt, father of four and husband, is moved to act when he hears shots ring out near his apartment door. He decides to start filming police activity, especially the excessive violence. “He and his chapter of Copwatch become guardians of Mike Brown’s memorial, rebuilding it when it is vandalized and later removed. His counter-surveillance of local police results in his eviction and the eviction of other activists in the neighborhood. While fighting for justice, Whitt also struggles for his family’s livelihood,” according to whosestreetsfilm.com. “Underground hip-hop artist and activist Tef Poe arrives at Canfield Green to see blood fresh on the street. Tef is one of many who refuse to go inside, even when faced with military weapons and an enforced curfew. While on the frontlines, he meets Tory Russell, a powerful speaker and activist, and together they form Hands Up United.” Russell leads a march to the police station and in the midst of anger and frustration tells his constituents that it will take more than a day to get 500 years of answers. “Whose Streets?” exemplifies what the great Kwame Ture (Stokely Carmichael) stated about an organized Black people, that there is nothing we cannot accomplish. Although the policeman who killed Mike Brown escaped punishment, “Whose Streets?” shows how the people still won and continue to win. Damon Davis, co-director, East Ferguson resident and artist, painted hands held up – in surrender or confrontation – plastered the posters on the external walls of businesses who supported the new resistance movement and abandoned buildings boarded up after the civil unrest settled down. He met with Sabaah, who’d come to town on an ethnographic fieldwork assignment – she’d been collecting stories, when one of her contacts recommended Damon as a person who could help her shape the narrative and introduce her around. “Whose Streets?” is a horror story. In no way is the violence skated over or obscured as police march into pedestrians, throw canisters of tear gas without provocation. People with hands raised sling words at their opponents, yet instead of responding nonviolently, the police swing their sticks and fire their weapons. Sabaah said that after the major news outlets left each evening, the police dropped any semblance of decency. People with hands raised sling words at their opponents, yet instead of responding nonviolently, the police swing their sticks and fire their weapons. Sabaah said that after the major news outlets left each evening, the police dropped any semblance of decency. What is beautiful about “Whose Streets?” is the peoples’ will and commitment to not relinquishing their power and right to claim what is theirs – their neighborhoods, their streets and their right to occupy both. When scavengers show up to take photos and claim aspects of what for Mike Brown’s friends and family is sacred ground, the altar is dismantled and the community refuses to go on camera or participate in a public spectacle for the politicians. Samora Abayomi Pinderhughes’s soundtrack is exceptional – the words and music pulsing with energy like the folks on the screen. It is one adrenalin filled moment after another. We think we know the story, but unless you were there for an extended length of time, you really do not know what happened. Through the characters profiled, the audience gets a sense of the movers and shakers who serve as backbone to a larger number of people who up to Mike Brown’s death were passive and unresponsive. Even the leadership – I am thinking clergy and civic leaders – does not get active seeking a just outcome for the Brown family until the national spotlight makes them make a public statement. The tragedy has ignited a spirit that was not going to retire any time soon. With the fourth anniversary of Mike Brown’s death this past August, “Whose Streets?” is a necessary rallying cry, the film itself a wonderful model of what a community can do to change a system stacked against them. For each community experiencing these types of daily rehearsals of injustice, somewhat like a catechism, the strategy will change dependent on the particular landscape. 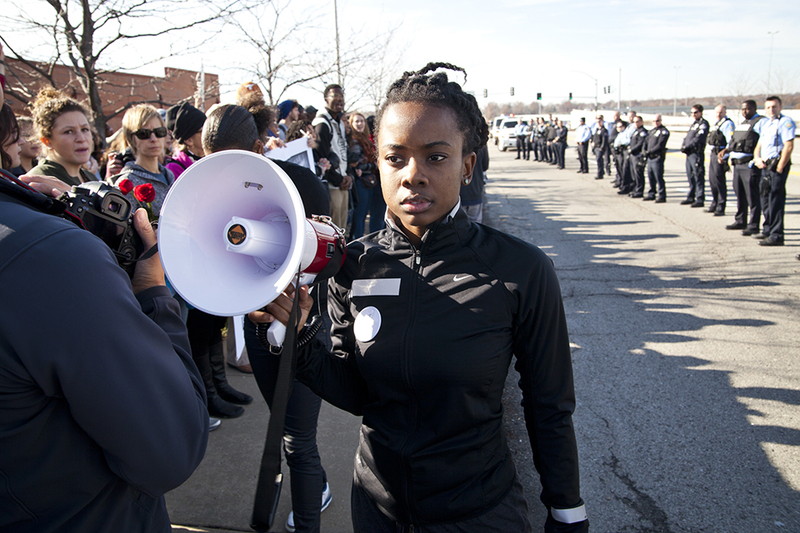 “Whose Streets?” provides a model and as such validates Ferguson citizens’ right to resist and demand justice. Similarly, the citizens of Charlottesville deserve the same validation. State violence might be normed as is that of white racists against Black people, but it is not a norm we accept. With humanity on the chopping block, “Whose Streets?” shows ordinary citizens, beaten and intimidated, standing up. The world is what we make it and often just remembering the streets are a public space, that anyone is able to cross or walk on this marked piece of highway, is liberating for a lot of Black youngsters who do not know safety or freedom. With humanity on the chopping block, “Whose Streets?” shows ordinary citizens, beaten and intimidated, standing up. That’s liberating for a lot of Black youngsters who do not know safety or freedom. Here is a link to an interview with the directors in April when the film debuted at the San Francisco International Film Festival: http://tobtr.com/10184253. 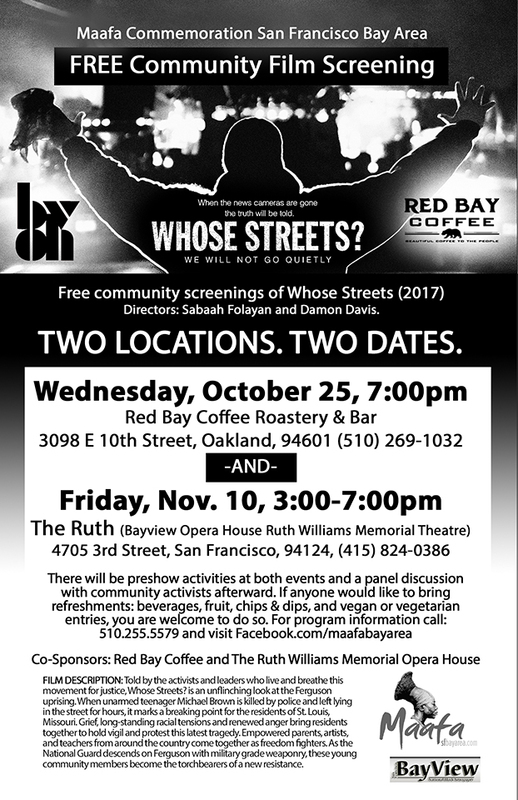 We will be having free community screenings of “Whose Streets?” (2017); the film website is http://www.whosestreetsfilm.com/. Wednesday, Oct. 25, 7 p.m., at Red Bay Coffee Roastery & Bar, 3098 E. 10th St., Fruitvale, Oakland, 510-269-1032. There will be activities preshow. If anyone would like to bring refreshments – beverages, fruit, chips and dips, and vegan or vegetarian entries – you are welcome to do so. Friday, Nov. 10, 3-7 p.m., at The Ruth (aka Bayview Opera House Ruth Williams Memorial Theatre), 4705 Third St., Bayview Hunters Point, San Francisco, 415-824-0386. “Told by the activists and leaders who live and breathe this movement for justice, ‘Whose Streets?’ is an unflinching look at the Ferguson uprising,” according to the film synopsis on the website. “When unarmed teenager Michael Brown is killed by police and left lying in the street for hours, it marks a breaking point for the residents of St. Louis, Missouri. Grief, long-standing racial tensions and renewed anger bring residents together to hold vigil and protest this latest tragedy. “Empowered parents, artists and teachers from around the country come together as freedom fighters. As the National Guard descends on Ferguson with military grade weaponry, these young community members become the torchbearers of a new resistance.